Mitch O'Connell: Police Log! The Hilarious "Crimes" of Small Town America! 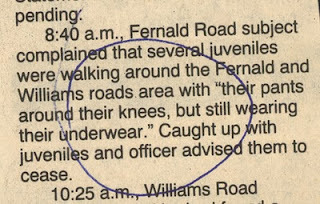 Police Log! The Hilarious "Crimes" of Small Town America! Way back when, my summers were spent with my sister at our Grandparents place in Fairfield Maine. As soon as I woke up I loved reading the Maine Morning Sentinel. all the calls that were received at the station. "Man found beaten with brick then sawed in half". Who wants that with their morning glass of milk?